Imagine Christmas with your family and friends cruising through the turquoise waters of the beautiful British Virgin Islands, in the Caribbean, with a very special offer… now you can! 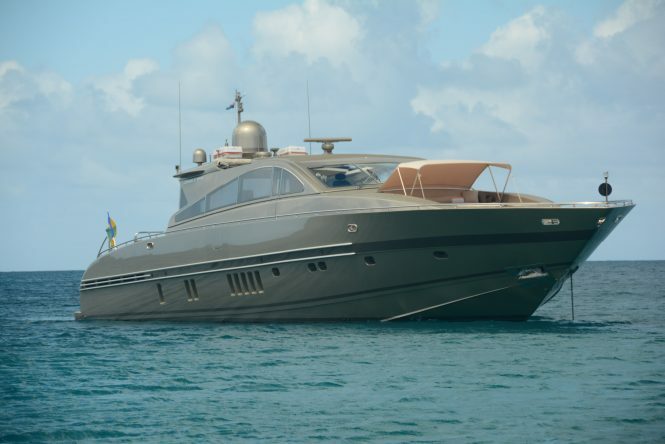 The 27m (88’) Leopard Arno motor yacht TENDER TO is offering to waive any delivery fees in the BVI for a charter booked over the Christmas week, so don’t miss out! Her striking gold hull and performance capabilities will have onlookers in awe, as you effortlessly enjoy the numerous islands. Built in 2005, she underwent a refit in 2015 and looks better than ever. 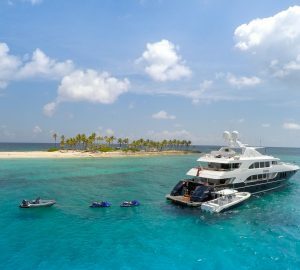 Her professional crew of 3 meticulously maintain the vessel and come with the highest of accolades from previous charters. Seven guests are accommodated over 3 cabins. The open plan living style is ideally suited to the tropics, she features an upper deck salon with opposing sofas, tables and entertainment systems. 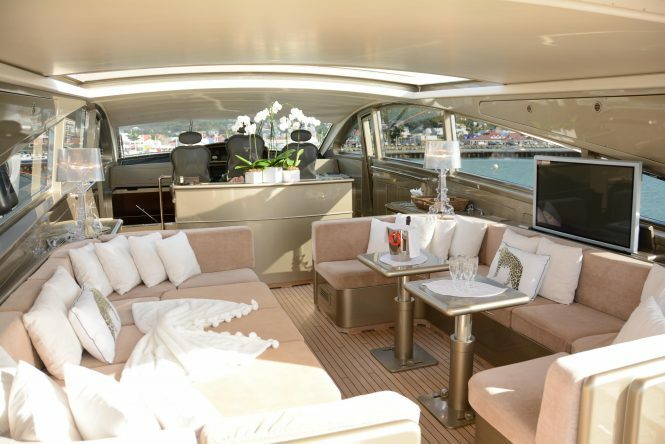 The entire space can be enclosed to enjoy the AC aboard, alternatively, leave the aft open and retract the roof, allowing the cool sea breeze inside. On the port side of the salon, the table drops to create a lovely day bed, making the space versatile and functional, no matter the group configuration. 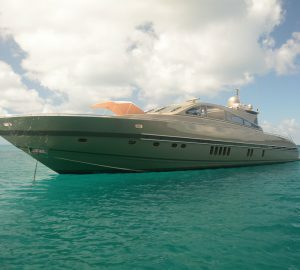 M/Y TENDER TO has plenty to offer when it comes to outdoor lifestyle. Stepping out from the salon, the aft deck has seating and a raised sun pad, which easily is removed, revealing an alfresco dining table. 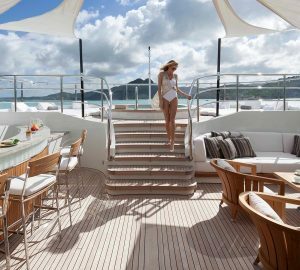 Charter guests that prefer a more private escape, will find the foredeck sun pad with optional Bimini cover the perfect spot to relax with a book, or simply watch the world go by. 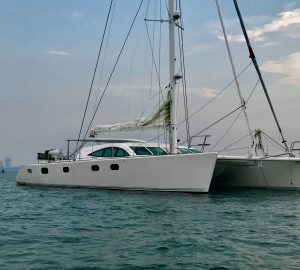 Of course, a Caribbean luxury yacht vacation is also a great time take advantage of the warm seas, and aboard this Leopard (Arno) yacht, guests are offered a plethora of amazing water toys, which the crew will arrange on the extended swim platform, for easy use while at anchor. Accommodation is on the lower deck, comprising a master stateroom with a shower and tub, a double cabin and a twin cabin, with a Pullman berth. 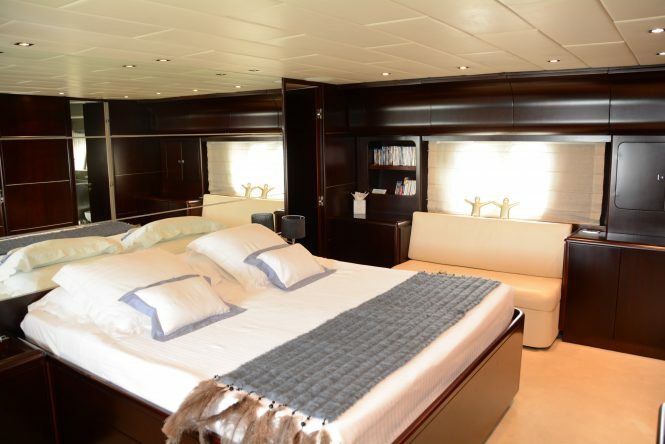 All cabins are en-suite, spacious and fully air-conditioned for optimal comfort. Fitted with twin 2000 hp engines, TENDER TO cruises at 28 knots and can reach exhilarating speeds of 37 knots. Please contact CharterWorld - the luxury yacht charter specialist - for more on superyacht news item "Great Caribbean Christmas Deal with 27m TENDER TO Motor Yacht".